Ongoing mobile and web technology advances are changing the way businesses operate, consumers buy and employees work. If your company is looking to keep pace with this rapid change and capitalize on the new ways to reach and influence consumers, Web application programming interface (API) Management may be right for you. Download this white paper to discover how Web API’s can help your organization do everything from improve e-commerce and fulfilment processes, to strengthen corporate branding and open new market opportunities. 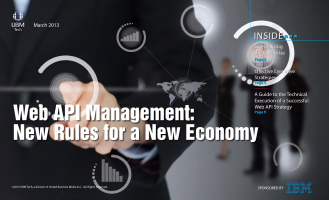 This report provides a valuable roadmap to managing Web APIs including setting goals, selecting which parts of the company to focus on, establishing a pricing model, and managing risks and rewards. The report also includes a concise Guide to the Technical Execution of a Successful Web API Strategy.